One of the things I've written about is taking your time in the kitchen and appreciating the process. No need to rush in and out of the kitchen as fast as humanly possible. Put some heart and thought into what you're doing and enjoy the steps and effort involved in what you're creating. 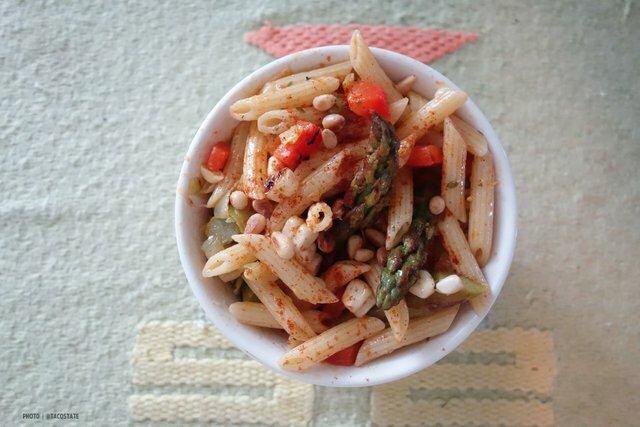 This pasta salad is just the dish to put you in that frame of mind. As simple as this dish appears, there are a few steps involved and each one is a short process all its own and when you give each element its due time and appreciate each step, every part will work together and the whole thing stand together in a strong way. 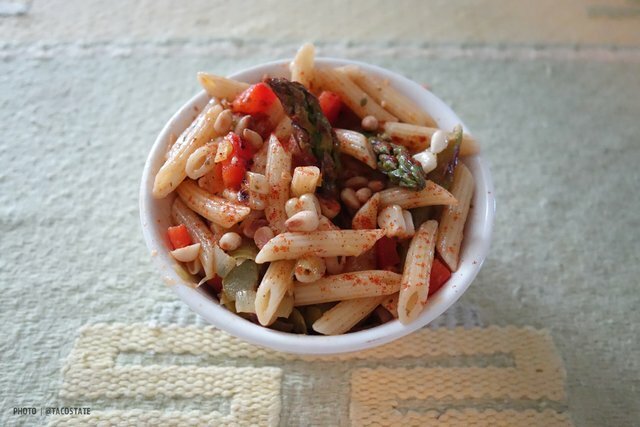 I love the smokiness you get from roasting vegetables stovetop and that's what we do with all of the veggies in this pasta--asparagus, red bellpepper, and corn on the cob. Bell Pepper: Char your bellpepper right over the flame, turning with tongs until the skin on all sides are charred. Place in a plastic bag to steam, making it easier to remove the skins after it's cooled. 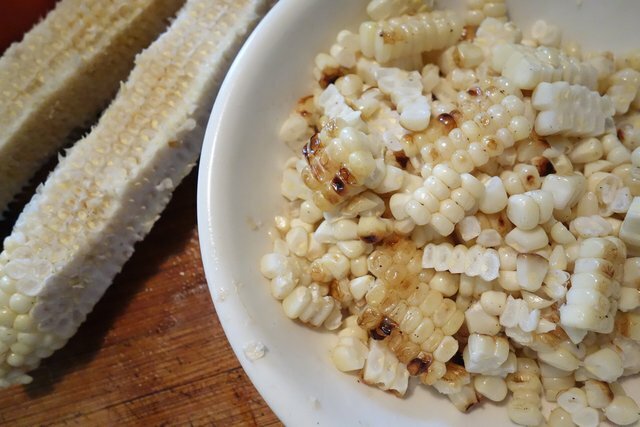 Corn: Put a small amount of butter and olive oil in heated pan with corn. Turn periodically until you see brown spots appearing here and there. Add bits of butter or oil if pan starts to smoke or if it needs it. Keep flame on medium. AIM FOR THE BROWN BITS! Asparagus: For the asparagus, I parboiled it first because these were thick stalks and often take some time to cook through. I used a pot of water that was not as wide as the actual asparagus, so that the tips mostly did not get submerged. That way, they retain a crispness and don't fall apart later. After about 4 minutes in boiling water, set aside and cool in either an ice water bath or place in fridge. 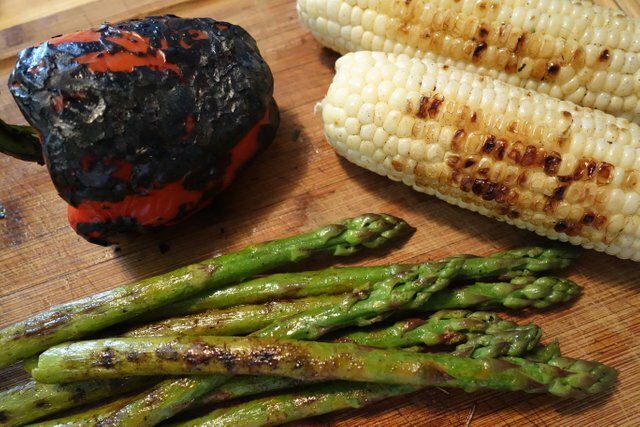 Once the asparagus is cooled, give them the grill treatment by putting them in a buttered/oiled pan under medium heat. They will lose some of the water that may have absorbed into them and start getting those beautiful brown spots. Before you remove, add a bit more butter and about a teaspoon of tarragon. Add a squeeze of lemon and set aside, making sure they're done by checking the thickest part of the stalk. 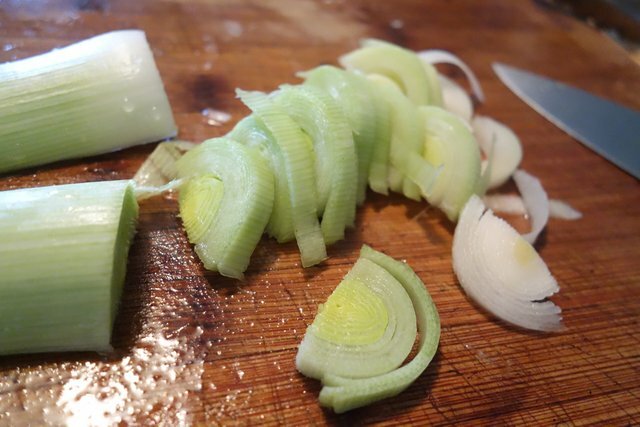 Slice a leek into half moons and begin cooking them in butter and olive oil. I recently got some "fresh" dried oregano still on the branch and have been using it more than I normally do and decided to put some into the butter for the leeks and it was a nice mixture of flavors. Once your other veggies are cooled off, they'll be ready for cutting. 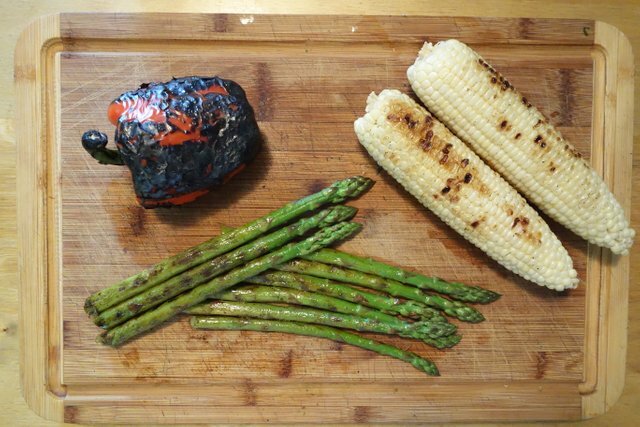 I diced the bellpepper in uniform little squares, the asparagus was cut at a slant in about 1 1/2" pieces and the corn was just cut right off the cob. During the above processes, you can start your water boiling for your pasta. Small penne was a good choice for this dish and it complimented without feeling like it was too much pasta. Also, you can toast your pine nuts which will only take a couple of minutes, so don't leave them unattended while they're in the pan. Once your pasta is done, toss with olive oil and add your vegetables, reserving the asparagus tops to add to the top of the dish. Add a good sprinkling of paprika and gently toss and taste for seasoning. Feel free to add a bit more oregano, salt or a squeeze of lemon if you feel it needs it. When every component of this dish is given the time and attention it deserves, this simple looking dish becomes transformative. Each wonderful element stands out on its own with robust flavor and together they work wonderfully. Serve at room temperature. Another keeper! Enjoy.